Editor&apos;s note: This was piece was produced in collaboration with the Chicago Architecture Foundation, which provided research, expertise and other assistance during its development. From his office tower in downtown Chicago, Mike Vendel has no reason to doubt the structural stability of the buildings where he and hundreds of thousands of others spend their workdays. Looking back on the Loop from the shores of Lake Michigan, though, it’s a different story. What special techniques or extra work is required to construct massive buildings on swampland around Chicago? He’s right to wonder. Steadying skyscrapers in Chicago (and, come to think of it, many cities around the world) is still a staggering feat of structural engineering. If architects and engineers don’t do it right, the results could be catastrophic: They could end up with a lopsided building or, worse, a fatal collapse. 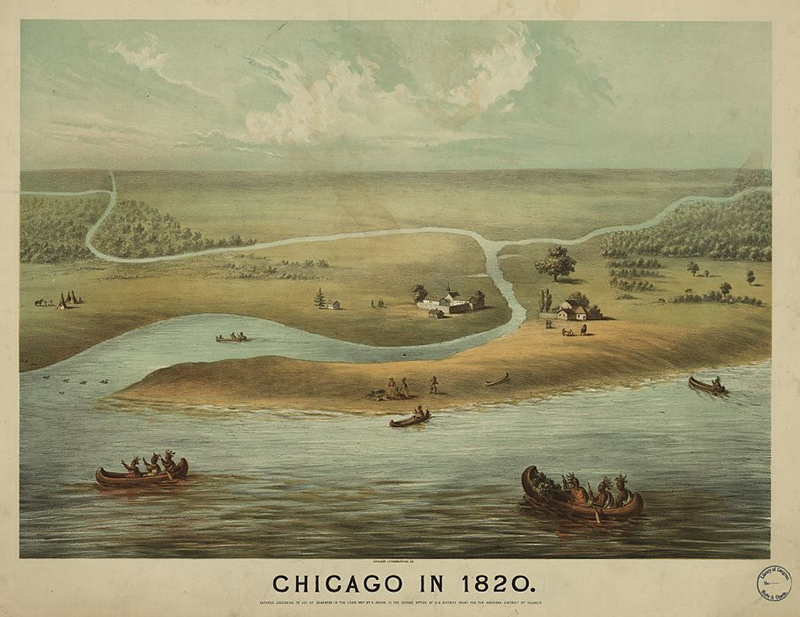 Offering just a short portage between the Great Lakes and the Mississippi River basin, the area that would become downtown Chicago was a natural choice for the city’s settlers — and a naturally swampy setting. Ray Wiggers, a geologist with Oakton Community College, says Chicago’s bedrock is buried beneath silt, mud and clay. The soil was so slick that in 1856, Chicago lifted itself up to 14 feet off the ground to keep from sinking and sliding around in the mosquito-infested marshland. Chicago’s soil started as sediment drifting around in Lake Chicago — an ice-age precursor to Lake Michigan. That material settled to the bottom, leaving present-day denizens a thick layer of squishy soil. By contrast New York City — whose architects and engineers pioneered the skyscraper along with Chicago’s during the late 19th century — had nearly perfect soil conditions for anchoring tall buildings. Despite being surrounded by water, Manhattan has readily available bedrock. The rock outcroppings jutting out of the earth in Central Park are visible proof that New York’s bedrock, Manhattan schist, comes all the way up to the surface in some places. Chicago’s equivalent, a rock called dolomite, can be as deep as 85 feet underground. “And yet here in Chicago we persevered through all the muck, literally, and built [skyscrapers] here,” Wiggers says. That clay actually became the key to some early engineering solutions for tall, heavy buildings. Before then, they fine-tuned a method to float their massive buildings on layers of jelly-like clay called the desiccated crust. But as anyone who has stumbled through the lobby of the Auditorium Building has experienced, early engineers didn’t always get it exactly right. The 1889 Auditorium Building is well-known for the important role it played in establishing the artistic and cultural identity of a young, booming city. 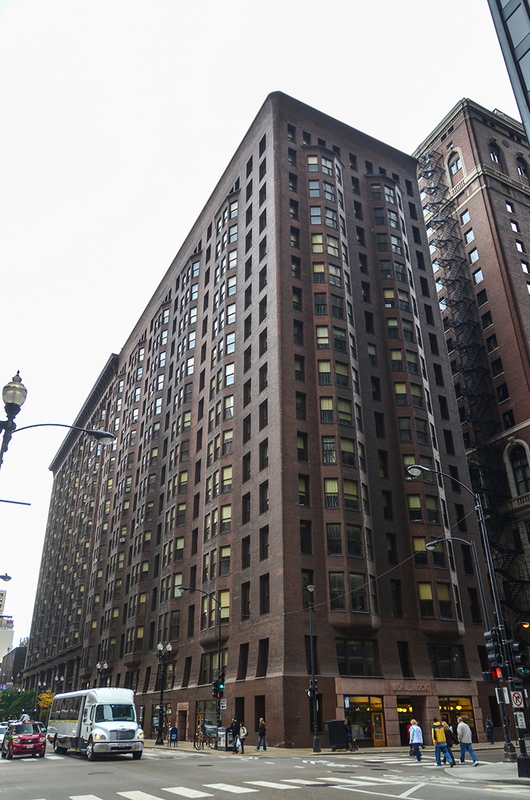 Roosevelt University now owns the building at the corner of East Congress Parkway and North Michigan Avenue. The multi-use building, designed by Dankmar Adler and Louis Sullivan, included an exquisite performance space with stunning acoustics and ornamentation. But the building also sheds light on how these late 19th century architects wrestled with designing increasingly taller and heavier buildings on Chicago’s waterlogged clay. If you’ve ever visited the Auditorium Building or Theatre, you may have noticed that the floors are not quite even. And if you’ve come in the Auditorium entrance off the Congress Parkway, located under the building’s 17-story tower, you may have noticed that you walk down about four steps to buy your ticket and enter the lobby. Those four steps were not part of Adler and Sullivan’s original plans — they were added because that’s how far the building has sunk into the earth since it was constructed in 1889. The building weighs more than 110,000 tons. All new buildings sink a bit at first — a fact architects and engineers have tried to account for since they began building big enough to notice. But the Auditorium sunk more than 18 inches in the first year after it opened, leaving it with uneven floors that can make visitors feel drunk as they navigate. The technical term for this is “differential settlement,” which means that the different parts of the building — depending on how heavy they are and how much the soil can bear — settle to different depths. In the basement of the Auditorium, there’s a large crack on the concrete floor that runs parallel to the exterior wall. While the whole building has settled, this is where it’s obvious that the heavier exterior stone walls have sunk almost a foot more than the interior structure, which was made from a lighter iron and steel skeleton. The 1880s and 1890s saw several Chicago buildings that used a hybrid structural system of stone and brick on the exterior with iron and steel on the interior. 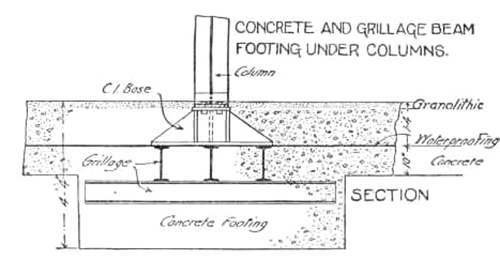 But because architects knew that a continuous foundation around the building’s perimeter would likely sink at different rates and to different depths, Adler and Sullivan designed a foundation system of isolated piers to distribute the load at several points across the building’s base. These piers under the building resemble giant pyramids measuring more than 12 feet tall. They acted like the legs of a chair, redistributing the heaviest parts of the building’s uneven footprint over a larger area. But these giant pyramids — made with layers of wooden timbers, crisscrossing steel embedded in concrete, and blocks of stone — took up valuable basement space. 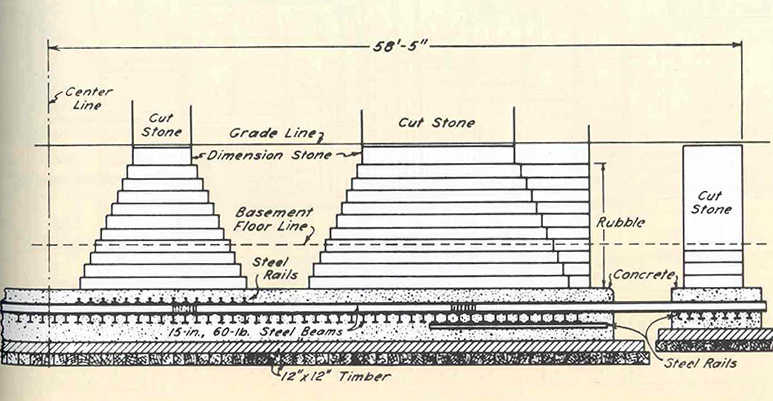 Adler conducted extensive tests of the Auditorium footings, loading them with heavy pig iron to simulate the weight of the building and then measuring how much they sank into the earth. But this is an imperfect science. He based his calculations on exterior walls of brick, not the heavier granite and limestone that would eventually be used. It also became clear that the 17-story tower simply weighed more than the 10-story building surrounding it. And the weight of the exterior stone walls was much greater than the lighter skeleton frame of steel and iron used on the interior. As skyscrapers in the late 19th century grew taller, architects and engineers experimented with ways of preventing buildings from sinking too far into the clay, or settling unevenly. Burnham and Root’s 1891 Monadnock Building, which sits at the southwest corner of Jackson Boulevard and Dearborn Street, is one of the heaviest skyscrapers still standing. Its dark brown brick walls measure six feet wide at the base. The building’s basement holds clues to how such a heavy building stands without its feet on solid bedrock. Owner Bill Donnell explains that the Monadnock is distinctive because it’s one of the tallest buildings with walls that actually do the work of holding it up. During the 1890s, buildings needed to get taller, so architects started shifting away from load-bearing walls; instead, they opted for a sturdy skeleton of steel. Construction crews at the time couldn’t dig down 80 feet to find bedrock, so they floated the building on the clay. They took steel railroad rails and layered them into pyramid-shaped footings that could distribute the building’s weight over a larger area. 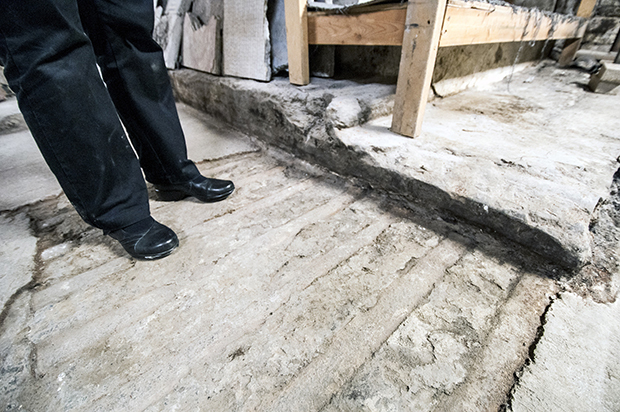 Picture dozens of columns pressing through the basement floor with pyramid-shaped feet, made from railroad rails caked with concrete. These so-called ‘grillage’ foundations were used in several other Burnham and Root buildings throughout Chicago in the 1880s and 1890s, including the Rookery and the now-demolished Montauk Block and Great Northern Hotel. Burnham credits Peter B. Wight, who came to the city from New York after the Great Chicago Fire of 1871, with helping to engineer the first one. In fact, if we think back to our question about Chicago’s swamp, this type of floating raft foundation actually makes a lot of sense. Imagine a tall tree growing in a water-filled swamp. Just like the Monadnock’s foundations, the tree trunk flairs out wide at the base. With only a shallow root system, this is the tree’s only way of buttressing itself in the mud. The Monadnock is actually a hybrid; its northern and southern halves were completed a few years apart, and feature different structural systems. The north half of the Monadnock was the end of an era in structural design, showing the challenges of this type of floating-raft foundation and thick masonry walls. 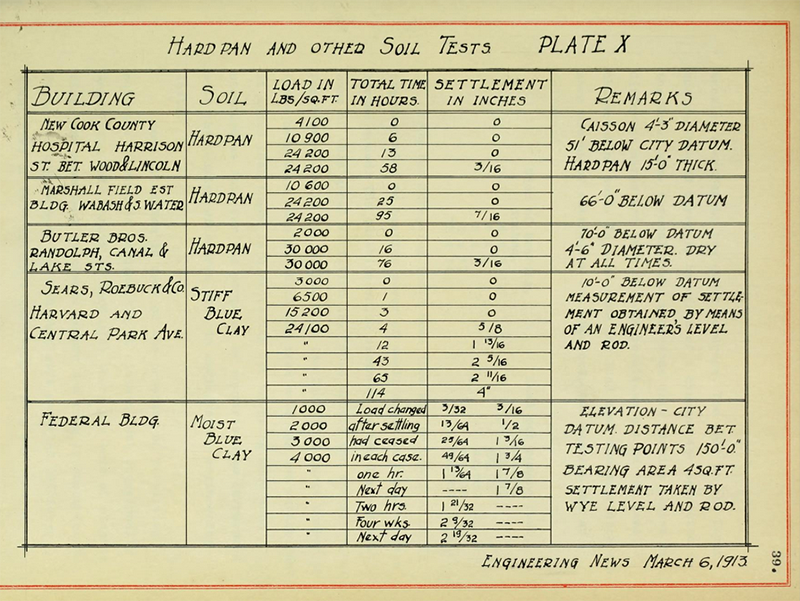 A lot more than swampy soil factored into the desire for new structural systems around this time. As land values climbed, developers and clients required taller buildings to make building profitable. That meant architects and engineers needed to economize while also still strengthening the structure against gravity and wind. And if the walls of the building get thicker, the result is smaller rooms with less rentable space. Thicker walls also meant smaller windows. Long before the widespread use of strong electric lighting, natural daylight was a premium amenity that all tenants wanted. 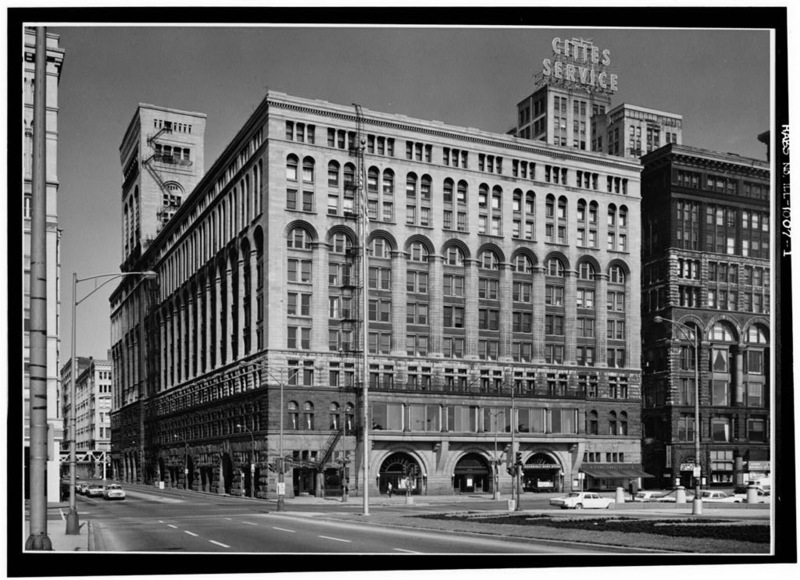 Things changed a bit when the owners of the Monadnock Building expanded only a year and a half later. They commissioned architects Holabird & Roche for the southern addition and rather than design another load-bearing brick building, the architects developed a lighter-weight steel skeleton frame building. Although it used a similar foundation, this steel skeleton frame brought benefits beyond simply weighing less; it had thinner walls, used less material and could be constructed faster. Just one year after the Monadnock’s southern addition was built, another dramatically different type of foundation system, called caissons, was attempted for the first time in a Chicago skyscraper. At Adler and Sullivan’s Stock Exchange Building construction site, crews were finally able to drill down through all the clay and fill the holes with concrete, which anchored the building to the bedrock. Caissons were basically subterranean chambers that could keep construction work dry even deep underground. They diminished the need to float the building on top of the squishy soil, which meant that architects and engineers could experiment with new types of structural systems above ground. Architects in Chicago have dug enough foundations to know their way around the city’s famously swampy soil. But in many cities geotechnical engineers are still searching for solid footing. Baker knows this problem well. In 1957 architects Walter Netsch and Bruce Graham used steel pilings to anchor Chicago’s Inland Steel Building to dolomite bedrock buried deep beneath the Loop — the first time after almost seven decades of skyscraper construction that design teams and engineers had accomplished such a feat. Though most of the digging and surveying underground is done remotely these days, Baker recalls looking up from 70 feet beneath the AT&T Corporate Center, which opened in 1989. He says even though new technology makes it easier to find solid bedrock beneath 100 feet of wet clay, it doesn’t always make sense to drill that deep. Modern engineers still use the same general principle Burnham & Root employed when they floated the foundations of the Monadnock Building on an even flimsier layer of soil known as desiccated crust: They just spread the load. Only, today, they prefer a compacted layer of clay found deeper than the crust, called hardpan. And Baker says Chicago’s legacy as an innovation center for geotechnical engineering is very much alive. While Chicago may have been dealt an unlucky geological hand, 19th century Chicagoans did find something useful to do with all the mucky clay: The city became the center of the nation’s terra cotta industry. Architects used terra cotta, which is simply baked clay, to help fireproof buildings after the Great Chicago Fire of 1871. So it might just be that Chicago’s sloshy soil helped solidify the foundations of modern tall building design, engineering and construction. Mike Vendel, a computer programmer for Accenture, grew up in Chicago’s West Lawn neighborhood and now lives in Edgewater. He says he first wondered about Chicago’s swampy soil when volunteering in parks along the North Side lakefront. Looking south one day from Montrose Beach, Vendel noticed that Chicago’s mighty skyscrapers were basically sitting on the same soggy footing he was. “I see these giant buildings on the horizon. And then I look down at the sandy soil I&apos;m standing on and I think, how do those massive and immense buildings stay stable in a soil like this?” he wrote at the start of our reporting. He wondered about the geology of our region and how early settlers overcame Chicago’s swampy conditions to lay the foundations of a 20th century skyscraper boom. Chris Bentley reports for WBEZ’s Curious City and is the Midwest Editor of The Architect’s Newspaper. 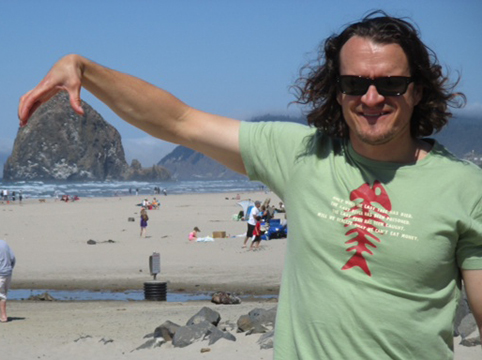 Follow him at cabentley.com and on Twitter at @Cementley. Jen Masengarb is Director of Interpretation and Research at the Chicago Architecture Foundation. Follow her on Twitter at @jmasengarb. When Will Chicago Get Its Next Supertall Skyscraper?